Stormy Productions is a very small software development company specializing in iPhone app development. The company focus is primarily on iPhone radio app development. 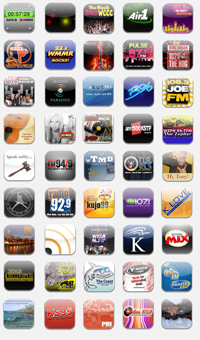 We have successfully developed more than 65 iPhone apps that are already in the iTunes store now. These apps have been downloaded over 2 million times! Currently, Stormy Productions is a one person shop - all work is performed solely by the founder, Brian Stormont. As a result, availability is limited for taking on new projects. Feel free to contact Stormy Productions to inquire about project availability. If you are a software developer looking for assistance in creating a radio app, you may also find Stormy's RadioKit SDK helpful. The SDK includes complete sample projects for creating a basic radio app. Our Radio Paradise iphone app (which uses the RadioKit SDK) has received a 4.5 mouse rating from Macworld.